Herbal remedies for anxiety may be worth a try if looking to avoid unnecessary side effects from prescription and over the counter medications such as addiction, other health issues, and more. Some may turn to other stress reducers for an added insurance such as preventing panic attacks while sleeping or awake, and other anxiety issues. Stress reducers such as yoga, meditation, visual or music therapy, and more are mind/body altering actions which will play a role in limiting stress induced anxiety. Some of the herbal remedies for insomnia are also beneficial for anxiety cases. Many feel such herbal fixes are worth a try for bouts of anxiety and for dealing with panic attacks as well as the triggering reasons for such events. 1. VALERIAN ROOT is a powerful herb known for calming nerves and inducing sleep and can be taken in supplemental form or as a brewed tea. 2. PASSION FLOWER is known worldwide as a natural sedative for anxiety. It is available as a tincture, dry herb, extract of tea. 3. HOPS is another one of the valued herbal remedies for anxiety and other tension induced symptoms. 4. CHAMOMILE, an herb taken in the form of tea, will conquer anxiety as well as relax muscles and settle an upset stomach. 5. KAVA ROOT is available in supplemental or drink form and is known to eliminate anxiety and stress while providing a clear thinking, calmer muscles, and a well feeling. 6. SKULLCAP is an herb with sedative properties to treat nervous tension, insomnia, and especially anxiety. 7. LEMON BALM is an herb from the mint family which decreases anxiety while dealing with mood disorders. It is also known as a fever reducer and helps with digestion. 8. WILD YAM is known to balance female hormones and will affect anxiety based moods. 9. 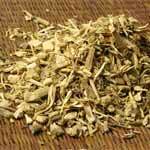 ST JOHNS WORT is an herbal tincture which is known to recondition emotional well being and alleviate depression. 10. MOTHERWORT is another herb which aids in hormone balance and a woman’s menstrual cycle. It is known to reduce a mother’s stress related tension during pregnancy, birth, and as a mother.